N. Jeffrey Blankenship of Florence, KY, attorney and friend of the late Dr. Edward A. Patrick, has written a letter of concern to Jonathan Kurtz, president of Prometheus Books, the company that recently published my father's memoir, Heimlich's Maneuvers. I understand that, for some reason, you have chosen to publish memoirs by Dr. Henry Heimlich, which completely omits any reference to one of the critical partners of his development of research throughout his career, Dr. Edward Patrick, Ph.D.
...Dr. Ed Patrick, now says he helped invent the [Heimlich Maneuver], which he calls “Patrick-Heimlich Maneuver.” Although Dr. Heimlich denied those claims, I remember meeting with Dr. Patrick myself and, although I am not an engineer, Dr. Patrick explained to me the engineering basis which he had provided to Dr. Heimlich for the maneuver. ...I am sure you can see that you should at least explore this information and allocate to Dr. Patrick some credit for his contribution to a number of Dr. Heimlich’s accomplishments. Dr. Patrick was an integral member of the Institute of Science of Medicine and Engineering (based at the University of Cincinnati), commonly known as the HARP group. 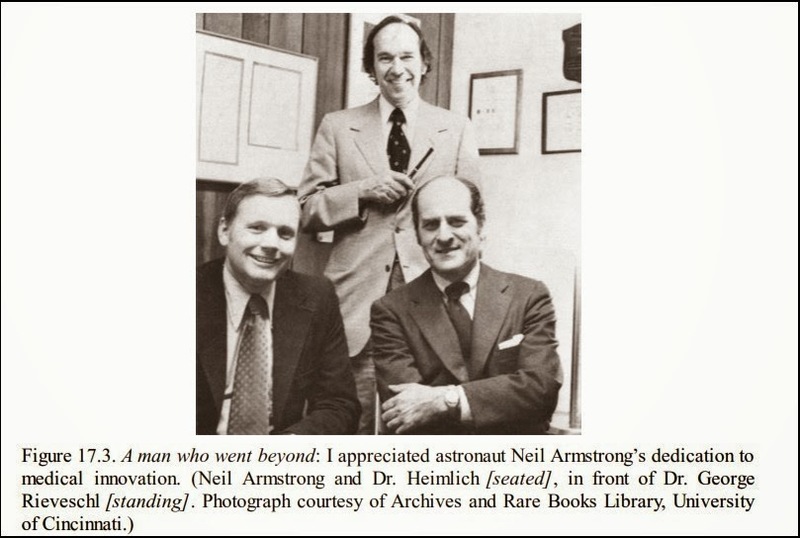 HARP was an acronym for Heimlich, (Neil) Armstrong, (George) Reivershel [sic], and (Ed) Patrick, M.D., Ph.D.
As of recently, Neil Armstrong was the last of the three remaining partners of Dr. Heimlich to die...(It) is interesting to me that Dr. Heimlich chooses to publish these memoirs after all of the partners who could contribute to this publication have pre-deceased him.